The CinemaTube BV-5005HD is a standalone media player with HDMI 1080p output. First, some background on my particular application. I always wanted a DVD jukebox so that I could store all of my DVDs in one location and watch them at will without having to chase down a DVD and insert it into the player. The advantages of storing DVDs on a big hard drive instead of a carousel of optical discs are fairly obvious, the main one being lack of complicated moving parts. My first attempt at this used a linux computer running MythTV. The DVD images themselves were stored on my fileserver. Using a fileserver to store the DVD (as opposed to storing them on the player’s hard drive) has several advantages. First and foremost, the fileserver is already a high-performance rundundant machine with RAID mirroring. I don’t have to worry about a hard drive failure causing loss of the DVD images requiring me to reload them all. Second, the noisy hard drive is relocated far away from my TV room, leading to less distraction. Third, multiple players can be used to make the library available to multiple televisions. The MythTV solution worked pretty well but had some drawbacks. Since I used a general-purpose linux PC (my old desktop machine from years past), it was a noisy power-guzzling machine. I was able to quiet it down substantially by using a SSD for the boot drive (I experimented with remote-booting, but found remote boot to be a pain to maintain). However the CPU fan and GPU fan could never be quieted down to truely silent operation. There was also an occasional stutter in the video output that I never could get sorted out. Wait…. This is supposed to be a review of the CinemaTube, right? It has to look and act like a DVD player, and play DVD ISO images. Silence. No noisy fans to irritate me. HDMI / 1080p output. For connecting to the flat panel TV. Samba/SMB capability over ethernet. For use with the fileserver. 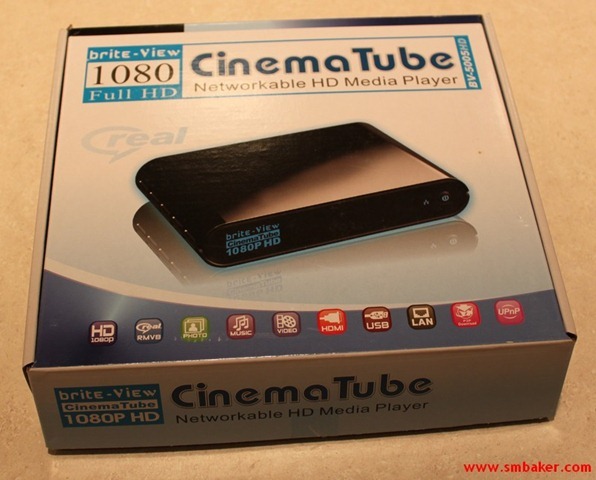 The CinemaTube by Brite-View was one such device that fit the bill, so I ordered one from amazon.com. Let’s take a look at this thing in detail. I started by doing the obvious, I connected a HDMI cable from the CinemaTube to the TV and powered it up. Boot is very quick, about 10 seconds, which close enough to instantaneous to make me happy. Much better than the old mythtv box. The UI is relatively simple. 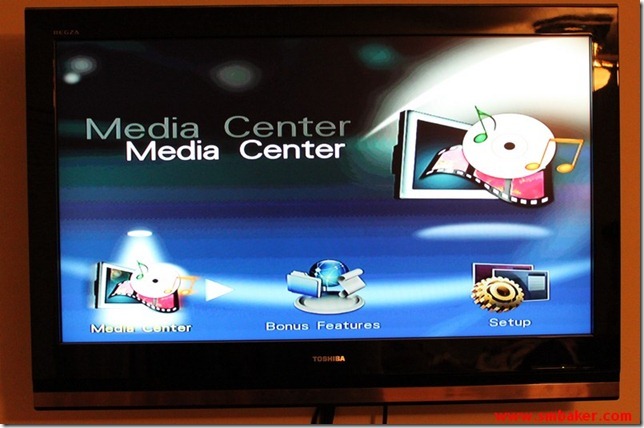 There are three options – Media Center, Bonus Feature, and Setup. My first visit was to the setup screen where I manually configure my desired resolution and gave the box a static IP address on my network. It’ll do DHCP by default, but I’m a static IP sort of person. After setup I went to the Media Center screen. This is where you get started on playing back your desired media (well, duh!). It has options for HDD (via the USB port), PC (via ethernet/samba), and UPnP. Once you pick the video you want to watch, just hit the select button again and it will go fullscreen. The best thing about the CinemaTube is that it works just like a DVD player. The remote control sports all of the usual DVD controls and it also support DVD menus, something that not a lot of other media players will do. You can pause, skip chapters back and forth, etc. Just like your normal DVD or blueray player. The next step was to enable audio output to my stereo. Every other digital device I’ve ever used with my stereo used a coaxial audio connection. The CinemaTube was the first device I ran into that offered only Toslink connection. Fortunately, I happened to have some Toslink cables laying around in the closet for just such a possibility. After a short misadventure that led to the realisation that toslink cables come with plastic caps that need to be removed, I was up and running. Audio started flowing from the stereo as soon as the connection was made. If you’ve never used Toslink before, it’s really kind of neat, being able to actually look into the end of the cable and see the bits flowing (well, it’s indistinguishable from any other red led, but that red light is your audio bits!). After my experiences with the CinemaTube, I’m a convert from the MythTV. The CinemaTube has played every media file I’ve thrown at it, a few which refused to play on the MythTV. It’s quiet, boots quickly, consumes little power, and has no stuttering or other playback problems. The remote control is intuitive and easy to use. It’s a simple device that does exactly what it should.